A time bank is a way for people to share their knowledge and skills with others in the local community and be rewarded for it – in time. For every hour of time you give providing a service for another participant, you receive one hour time credit. Everyone’s time is equal. What does a Timebank member do? As a Timebank member you give a few hours of your spare time when you want to, doing the things you enjoy. You receive the opportunity to get some help for yourself, if you need it. Plus you have the satisfaction of making the quality of life better for someone else. You earn time by helping others, by accepting a request from the coordinator if you feel able to provide the Service requested. There is no pressure just help when you can. There is no registration fee and all time is given freely – however there could be a charge for materials if used. This can include fuel costs which would be down to the provider if they charge or not. We set this expense at 40p per mile. Membership is for all ages — everyone has something to offer. We help the busy with jobs they don’t have time for, we help those that need it by becoming a phone friend or a companion, we help those people that cannot cope or do not have the skills, we help the young with CV’s and passing on the knowledge and skills of our Timebankers and best of all we help to get rid of those outstanding niggling jobs and fill in the gaps that the welfare are unable to do. What skills are on offer? We have skills ranging from teachers for extra tuition for students, retired plaster and skilled IT people to teach their trade as well as help with odd jobs, sewing, shopping just to name a few, the list is never ending. The more people that join the more skills become available. Just ask someone may know how? See what we have on offer. If I offer to give lifts am I insured? You will need to check with you insurance company – it varies from company to company. See full details on using your vehicle for volunteer driving. You make new friends, TimeBanks build social networks of people who give and receive support from each other, helps to get those niggling jobs done and dusted. By helping others gives pleasure and satisfaction, you may have helped an isolated person and brought them back into the community. It’s work you enjoy doing. We can work with you to get bigger jobs done. TimeBank has some professional people willing to pass on their skills and voluntary work is recognised and looks good on a CV. Does it affect my benefits? The government ruled in 2000 that earning time credits will not affect entitlement to benefits. However there is a law that says people on benefits cannot volunteer for more than 16 hours a week. To be on the safe side, if you are on benefits tell your social worker that you have joined the time bank and what activities you are likely to do within the time bank. Do I have to pay tax on my time credits? The government ruled in 1999 that time credits are not taxable. They are a way of recognising the time and effort people put into their local community. Does your business want to help the community? Do you want to raise your profile as a socially responsible organisation, or simply want to help your local community. We work with businesses as well as individuals. Take a look at our guide to business membership. Where can I find your latest newsletter? Does it take away from the professional tradesmen? To the best of our ability we do not. We assess any big jobs first so that we know what is entailed. we are also aware of the receiver’s circumstances, to the extent as to whether they could afford a professional or would even want to ask a professional. Many people suffer and go without due to lack of money and would never be able to afford the professional rates. We will check out jobs to diagnose the fault – however we never touch gas or electric problems as our insurance would not allow and it does need a registered engineer. We am very much aware that people will complain if we take away professional work but this could be said about everything we do. We have to judge and learn about our members to know whether the ‘lack of’ can cause hardship and/or finance is not available. To help those members we have to use more capable members and some money but they too then wish their hours to be repaid – again we try to only to use skills that are not too professional – i.e: grass cut – but again you could say that we are taking that away from a professional gardener. But they may just be too busy to do it themselves and they’d never employ a gardener. Unfortunately there is no definite line between skills to govern by – timebanking is open to all levels of skill being equal. To the best of our ability we ensure that we are not taking work from professionals, in fact in some cases even recommending professional help as in a damp area that one of our members had. We hope this allays any fears that you may have that we are over stepping our mark. This is a National report – However we can confirm that St Neots TimeBank is a member of TimeBanking UK therefore the information is relevant to St Neots TimeBank members. How do I earn Time Credits? Any TimeBank hours you give helping others can be exchanged for Spice Credits at a rate of no more than 10 a month. How do I exchange hours for Time Credits? Contact the Coordinator who will have a record of hours you have earned and will send Credits to you. Where can I find out more about Time Credits? Details are on our website under ‘About us’. You can also check out Justaddspice.org for venues across the country that accept them. What do you do with the information given to TimeBank? 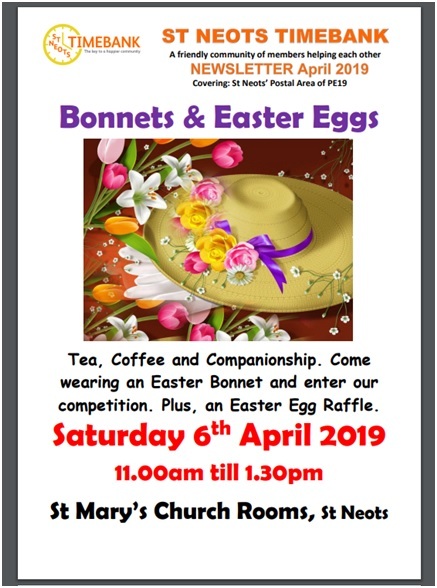 Please note that St Neots TimeBank is committed to ensuring that your privacy is protected. All personal information given to the TimeBank will be kept secure and confidential for Timebanking operations only and not be shared without your permission. Date of birth is requested for number count needed for funding and for your birthday. Telephone number and/or email address will be passed to other members, with your permission, but only those that have agreed to help you or vice versa – so that a time and place can be arranged. Emergency info is requested on the registration form – just in case our member visits and found you ill – the member or the TimeBank would need to contact someone you know that could take over and be responsible. 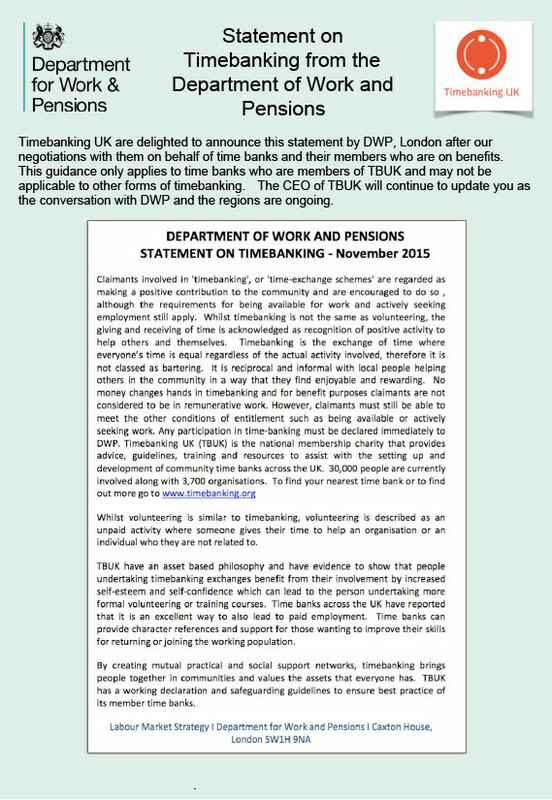 All other information given is held by the Co-ordinator and entered on a Database purchased from TimeBanking UK. Who also guarantee and promise 100% confidentiality. A copy of their privacy agreement is available on request. If exchanging hours for Time Credits, information is required for their records. Again a copy of their privacy agreement is available on request. Before handing over details, the co-ordinator will confirm that you are happy for us to do so.